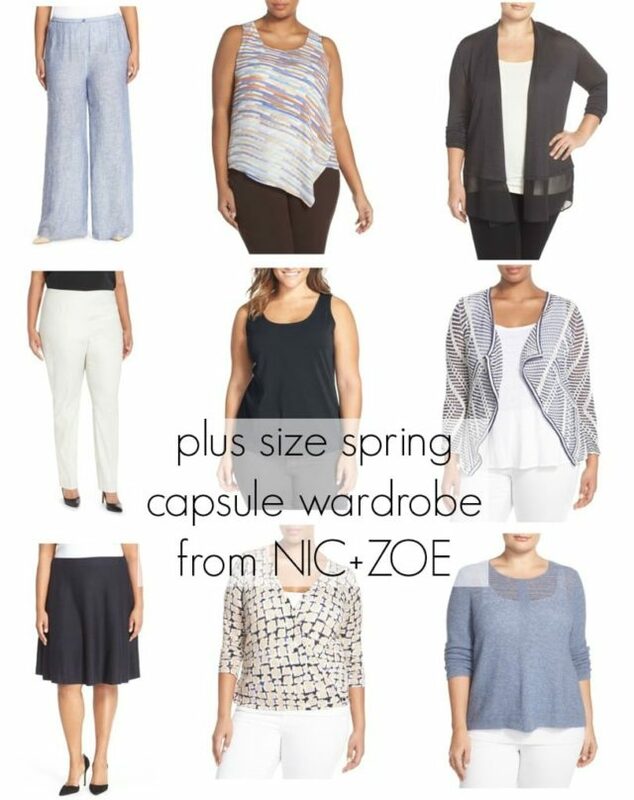 This is a capsule of work-friendly yet not stuffy pieces from NIC+ZOE’s plus size line. This is clothing that can go from the office to the weekend or even a vacation. The soft aquatic colors work perfectly with this season’s trends but also blend nicely with pieces you’re still wearing from your winter wardrobe (not only do blue and black look great together but it’s a hot trend right now!). The wide-leg linen pants can pair with the printed shell, the navy tank and cardigan, the wrap top, the navy tank with the printed cardigan, or a cami under the blue sweater. The ankle pants give a more polished look yet still work with all the same pieces and the lighter color will help darker colored winter sweaters transition nicely into the spring months. The navy skirt is paneled for a flattering fit and has a tonal jacquard pattern that helps it dress up and add a layer of interest to your ensemble. Pair it with the navy tank and cardigan, the wrap top, wear the printed cardigan with the navy tank or a tan or white top in your closet, and wear with the blue sweater (imagine adding a silver and mother of pearl necklace to the look!). Add some jeans, a Breton tee, and maybe a white v-neck tee with tan pumps or flats and metallic sandals to the mix and you’re set for a week’s vacation! 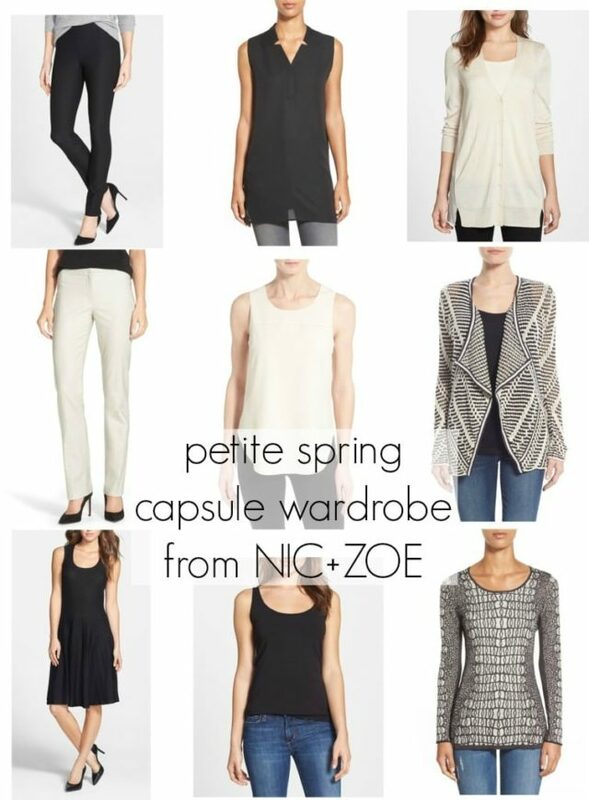 This is a capsule wardrobe from NIC+ZOE’s petite collection. Unlike the relaxed vibe of the previous capsule, this one has sleeker lines and a minimal color palette. Pair the slim black pants with the black sleeveless blouse, with the black tank and textured cardigan, the ivory shell and cardigan, the tile print top. The sandshell pants create an elegant look with the shell in the same color, with the black sleeveless blouse tucked in, with the black tank and chiffon back cardigan, the tile jacquard top. The sleeveless dress is an extremely flattering dress on its own, but would also look great with the sandshell cardigan (belted or not), or even with the tile jacquard top layered over it. The textured cardigan and the tank are the same pieces seen in the previous capsule, just in different colors. You’ll find the majority of the NIC+ZOE collection has the same pieces available in regular, petite, and plus sizes. Add a leather moto jacket, a pair of girlfriend jeans, some pointed toe flats and ankle booties and you’ll have a capsule that will go from desk to drinks with ease. 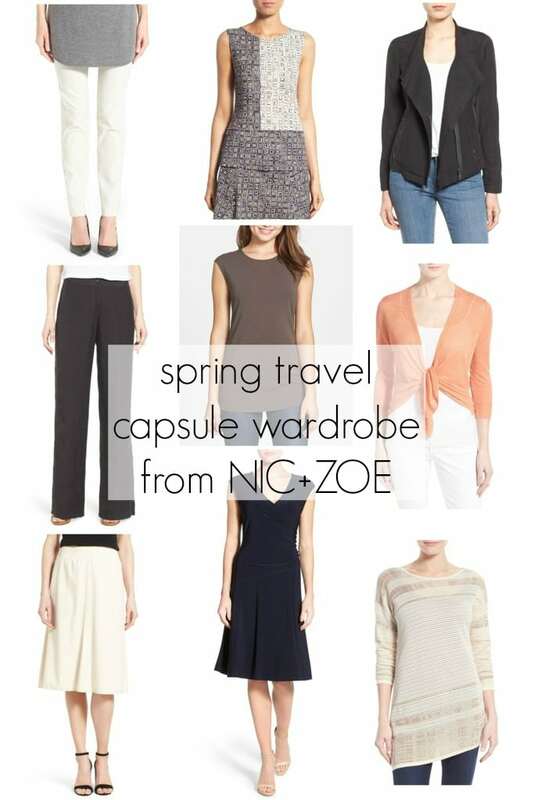 This final capsule wardrobe is for travel. Pieces that can handle being stuffed in a suitcase, spot cleaned with a bar of Ivory soap in a hotel bathroom, pieces that can dress up and down easily and layer to accommodate for changing temps. The peach cardigan can be worn open, buttoned on the sides to make a wrap sweater, knotted and twisted to create a multitude of looks while being lightweight enough to tuck in your bag when sightseeing. The wrap dress is one of those pieces that is perfect in any wardrobe – dress up for a wedding or wear with sandals for a casual cookout. The tunic sweater is lightweight with a variegated weave that can be worn untucked with the skinny pants, tucked into the wide leg linen trousers, or even knotted with the skirt. The moto jacket and the wide leg pants are both a linen blend that can look chic even if a bit wrinkled and rumpled. With the addition of a scarf or pashmina, a belt, some accessories for interest, a pair of comfortable walking shoes and some metallic flat sandals you’ll be set for your next excursion! But don’t think NIC+ZOE is only neturals and simple pieces to create capsules. There’s some amazing statement pieces like this mixed media jacket or this tweed jacket that incorporate one of the hottest spring trends, this uber flattering seamed and printed dress, or this statement-making cardigan. Time and time again NIC+ZOE impresses me and this spring is no exception. These look really nice. I wish they would show the linen as it will look after you sit down once, though. If that’s what it’s going to look like most of the time you wear it, showing it all pristinely smooth doesn’t help me imagine it. Now THIS is how to do a sponsored post! I can’t believe the time you put into posts like this, you really deserve whatever money these brands are paying you! I like the printed skirt and top in the travel capsule. If you’re two different sizes you can get a dress-like outfit that fits! That was last year. Since then I’ve worked a capsule (warm weather, fall/winter) for the last year. Haven’t pulled together a spring capsule because it’s been so darn rainy and cool here. But I see sunlight today and I need to go back into the closet. It’s a very different closet because I spent several months purging and hauling clothes to consignment (seven trips) and vintage (three trips) and pulling clothes to share or donate. And then I moved into our downsized apartment (hence all the purging). It should be easier now because I can see everything pretty easily.